Longtails and Lazers - Lazer Fishing Lures, metal lures for saltwater and freshwater fishing. Sight fishing to any species is favoured by a great majority of sportfishermen right around Australia. From trout to marlin, seeing the fish before the cast is made adds in indelible something extra to the thrill of the chase. In near offshore waters and the countless large bays around the coastline the various members of the tuna clan, along with the small mackerels constitute the bulk of the sightfishing opportunities. Of the various tuna species available none enjoys the same status among sportfishermen as the enigmatic longtail. Previously known as the northern bluefin tuna the longtail is a relatively common fish most often seen from 6 to 20 kilos but growing in excess of 35kg. High speed spinning to schools of breaking longtails is sheer bliss for many die hard sportfishermen and consists basically of casting metal, baitfish profiles on big threadline outfits. There is no better lure on the market for spinning longtails than the superb 50gm Lazer from Javelin Lures. Sold in a wide array of colours the Lazer can be used to tempt longtails no matter what part of the country you are fishing and regardless of what the tuna are eating. The longtail's diet is cosmopolitan and ranges from tiny transparent "eyes" to garfish, anchovies, pilchards and flying fish. It is a simple matter of changing lure colour to match the mood of the fish as they will behave differently depending on what their food source is on the day. Very successful colours for longtails in Queensland waters are chrome with silver tape, blue with silver tape and blue with red tape. All those colours in the 50gm Lazer produce fish when other brands fail to score especially when the tuna are flighty, feeding on the run as they do so often. Anglers in WA and the NT have reported success on the same colours as well as all white Lazers in both 50gm and 35gm sizes. Different locations seem to favour different colour combinations so it pays to have a range of colours in the tackle box to meet any demand, especially when travelling or fishing new waters. To find your longtails you'll need to use your eyes well. Watch for birds feeding and for the splashes made by the feeding tuna themselves. As visually exciting as is spinning for longtails, it is also tactically challenging, especially in hard fished waters. The accepted approach is from upwind with, one hopes, the fish feeding towards the boat. There are times when the fish will feed with the wind, usually when the wind and tide are in opposition and the tide is the stronger influence. Those times require a slight change of tactic and the boat is idled to within casting range. Whichever approach is required on the day, the boat is kicked into neutral once the school is within casting range, that is a long way when throwing 50gm Lazers. Don't, I repeat don't turn the motor off, the sudden absence of motor noise at close range will often spook the fish. Longtails will often sound within seconds of the boat coming within range so have rods ready with bail arms tripped ready to make the cast before the fish are within range, seconds count. Aim your cast to run along the front edge of the feeding school, allowing for the time the lure will be in flight. Newcomers often cast at the fish forgetting that in the four or five second it takes for the lure to cover the distance in the air, the fish have moved twenty or thirty metres. Close the bail arm just before the lure splashes down. This will help remove the belly from the line created by the arcing flight path of the lure. 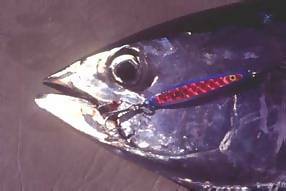 As soon as the lure hits the water start winding like crazy, you cannot wind too quickly for tuna. If all goes well you'll soon be hooked to one of the hardest fighting inshore sportfish in the country. 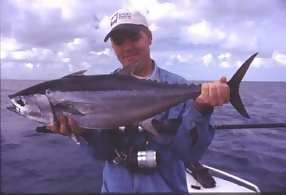 A ten kilo longtail on six kg tackle can take from 30 minutes to an hour to land on spin tackle. These are tough fish worthy of any angler's skills. The next time you see those birds wheeling and feeding on the horizon, race over and toss a 50gm Lazer into them, you'll be glad you did.